​We've Moved to a New Location! Michael Jabalee has specialized in natural healing for the body, mind and spirit for over 23 years. 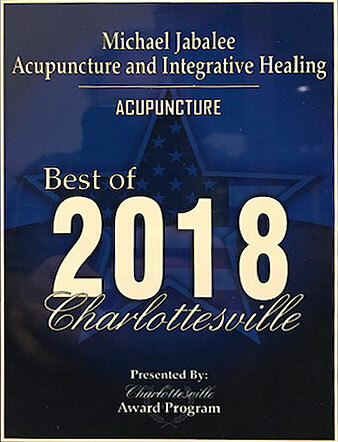 He utilizes techniques such as acupuncture, Auricular Medicine and homeopathy to treat a large number of 21st Century health challenges. In today’s world, there has been a huge rise in complicated diseases. Chemicals, toxins, additives, heavy metals, mold, and stress overload our adrenals and burden our immune systems. Modern acupuncture has been expanded and integrated with European Bio Energetic Medicine by progressive physicians throughout Europe over the last 60 years. Only a tiny handful practice this method in the U.S. This combination has tremendous advantages for effectively treating so many of our 21st century health challenges, such as Lyme, fibromylagia, chronic fatigue, hormone imbalances, toxin overload, and chronic stealth viral/bacterial/fungal/parasitic infections. We accept UVA Health Plan-Aetna.